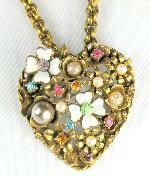 Hope you enjoy viewing these eclectic examples of heart-motif vintage and artisan jewelry. Pastel Rhinestones Imitation Pearls Heart Pendant Necklace and Earrings Demi Parure Silver-tone pendant necklace and matching screw-back earrings in the shape of hearts are set with oval, marquis and chaton rhinestones in shades of rose, aqua, amethyst and peridot green. Flower motifs with faux pearl centers complete the design. The necklace chain is 16" and the pendant measures 1 1/2" x 1 3/8". Earrings are 1" x 1". Coro Heart and Flowers Pendant Gold-plated and well-constructed heart pendant features two white poured-glass flowers with rhinestone centers (light amethyst and peridot green) and multiple flower motifs set with gray faux baroque pearls, faux pearls, and chaton rhinestones in shades of rose, topaz and aqua. This 1 7/8" x 1 3/4" pendant is suspended on an 18 1/2" complex chain with an older-style (no tab) spring ring. The very early signature is "Coro" in script and this beautiful necklace could be dated to the 1930s. Saint Laurent Black Enamel Crystal Rhinestone Heart Earrings Gold-tone earrings in the shape of hearts have black enameling and crystal rhinestone chaton borders and center highlights. Measuring 1 5/8" x 1 1/2" and designer signed SAINT LAURENT with an illegible mark below (possibly "rive gauche"). 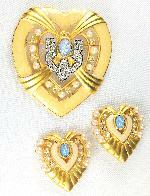 Elizabeth Taylor for Avon "Hearts of Hollywood" Brooch and Earrings Matte goldtone brooch and earrings feature a fiery faux opal, pearly inlay, crystal rhinestones and faux pearls. The pin also includes a riveted silvertone Art Deco-style element pave-set with crystal rhinestones. 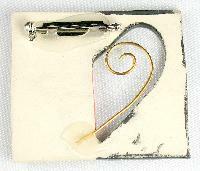 The brooch is 2 1/2" x 2 3/4" and the earrings measure 1 1/2". All three pieces are signed "ELIZABETH TAYLOR" and "AVON" with the signature "E" in script. This set is with original packaging including a lavender "E" box, purple felt drawstring pouch, pamphlet and lightly-scented lavender tissue paper. Trifari Hearts Rhinestone Necklace and Earrings Goldtone cutout hearts are crowned by crystal chaton rhinestones to create this lovely set based on design patents #152359 and #152358 dated January 11, 1949 filed by Alfred Philippe. The choker necklace is 14 1/2" x 3/4" and the clipback earrings measure 7/8". Signed "TRIFARI PAT PEND" with the crown over the "T" on all pieces, this demi-parure is in excellent condition. Florenza Heart, Rhinestone and Enameled Necklace and Earrings Bright silvertone necklace and earrings set with large opalescent faceted hearts, sapphire aurora borealis chaton rhinestones and smaller rose and jonquil rhinestone chatons. Lovely pale green enameled leaves complete the design. The necklace measures 16" x 7/8" and the clipback earrings are 1 1/4" x 1". This demi-parure is unsigned, but has the original Florenza hang tags still attached to both pieces. Private collection. Florenza Rhinestone Hearts Bracelet Antiqued goldtone bracelet features opalescent faceted rhinestone hearts alternating with star-motif sections set with amethyst rhinestones and faux turquoise ballotini. 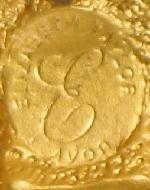 Measuring 7" x 5/8" and signed "FLORENZA" on the foldover clasp. Private collection. 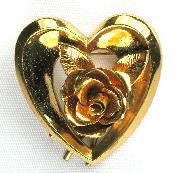 Coro Heart Pin Goldtone heart and rose design with heavy riveted construction, 1 1/2" X 1 1/4" signed "Coro" in script with the Pegasus logo. Avon Heart Pendant Necklace Hollow silvertone pendant constructed of multiple solid and framed heart shapes measuring 1 3/8" x 1 1/4" and suspended from a longer-than-typical 34 1/2" chain. This lovely necklace is signed "AVON" at the clasp. Siam Silver Enameled Pin From private collection. 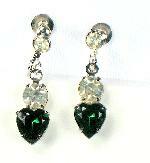 Green Rhinestone Heart Earrings Set in rhodium, these earrings feature crystal rhinestones and emerald-green, heart-shaped dangles. In excellent condition, these earrings measure 1" long. Venetian Carnival Mask Brooch Signed on the front "PLASCATOAg" likely "P La Scato Ag" with the "Ag" denoting silver plating. Purchased in Rome and from a private collection. 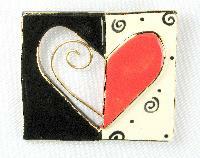 Enameled Heart Cutout Pin Plaster molded base with red, black and gold enamel and a gold wire heart motif. From a private collection. And they called it Puppy Love...Artisan handmade necklace of rose, white (snow) and crystal quartz natural stone beads with white glass lampwork three-dimensional puppies. Lucite hearts with sterling-silver heart overlay charms complete the design. 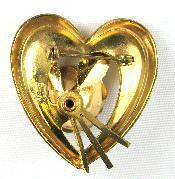 Measuring 24 1/2" x 1 1/2" with a sterling silver heart and arrow toggle clasp. A "Mary Ann, Mary Ann" design. Hearts on Fire A simple, but lovely design. Description: Necklace of natural crystal quartz beads, vintage lucite red and hematite heart-shaped beads, Czech glass crystal and diamond-shaped natural garnets. 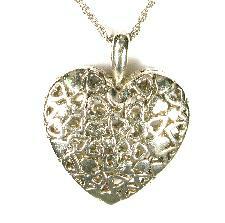 Silver heart centerpiece and sterling silver clasp and "love" charm. 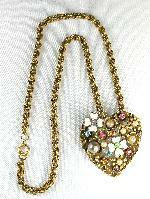 The necklace measures 24 1/2" and the hearts dangle is 6" long. A "Mary Ann, Mary Ann" design. Millefiori Hearts A unique lariat necklace highlighting gorgeous millefiori glass hearts. 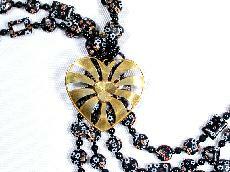 Description: Two strands of glass millefiori, seed and onyx beads, heart-shaped millefiori and onyx beads and a gold-plated heart centerpiece. The centerpiece is fully adjustable for length. It can also be removed and the necklace tied in traditional lariat fashion! 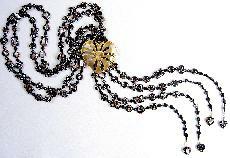 The length of each strand is 22" and the centerpiece measures 2" x 1 3/4." A "Mary Ann, Mary Ann" design. 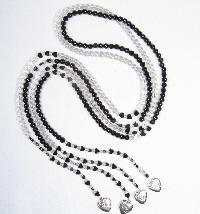 Onyx and Crystal Beaded Hearts Necklace and Bracelets A "Mary Ann, Mary Ann" design from a private collection. 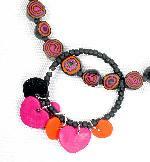 Pure-hearted Unique and eye-catching necklace. 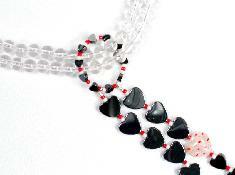 Description: A natural crystal quartz stone choker with two long dangles of millefiori, hematite and vintage lucite hearts. 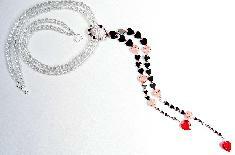 Accented with red and white seed beads, and a silverplated heart and arrow clasp. The necklace is 19 1/2" and the longest dangle is 11" long. A "Mary Ann, Mary Ann" design.